Live music: Swing Shift Orchestra and High Step Society. 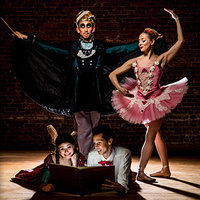 In Ballet Fantastique’s new Babes in Toyland, Choreographer-Producers Donna Marisa and Hannah Bontrager reimagine a lost holiday classic with retroglam choreography, vivacious style, and the company’s contagiously magical wit and whimsy. Victor Herbert’s original madcap fairytale mashup collides with hot jazz—played live by the incredible Swing Shift Orchestra—and splashy, genre-defying dance, filtered through the surreal sensibility of Fleischer Studios. A new ballet for the young and the young at heart.